Study Sport & Exercise Science at Solihull College & University Centre - Which? Must be in a relevant subject such as Engineering/Mathematics and/or Science disciplines. Access to HE Diploma in a relevant subject such as (Science or Engineering).Acheiving a minimum of 60 credits with 45 at level 3, with at least 15 credits at Distinction, 15 credits at Merit and 15 at Pass profile. GCSE C/4 or above in English and Mathematics or equivalent will be required. For entry into the second year of the HND a minimum of 120 credits at Merit profile or above and must be in a relevant subject in Sport disciplines. In a relevant Maths, Science or Engineering subject. 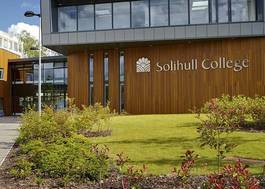 Please contact Solihull College & University Centre for further information. The Higher National Diploma in Sport and Exercise Science is an ideal qualification for people who aspire to work in the health and fitness industry, sports coaching or education. The two year programme provides enthusiastic individuals with the opportunity to study a broad range of core and optional modules, which have been designed to enable a multidisciplinary study of sport and exercise science at higher level, which will provide you with the knowledge and understanding of how scientific methods and principles are applied within the study of sport and exercise. Assessments are designed and delivered in the context of realistic workplace situations and might include a range from the following throughout the duration of the programme. Each unit can be assessed at Pass, Merit or Distinction levels, which are combined at the end of the qualification to give an overall grade of Pass, Merit or Distinction for the qualification.